European Foreign Policy in the Making? This book presents a ground-breaking comparative study of the bilateral relations of all 27 EU member states with Russia and an assessment of their impact on the EU’s efforts to conduct a coherent and effective policy towards its most important neighbour. While there has been a lot of research on European foreign policy, there has been much less on the role that national foreign policies play in it. 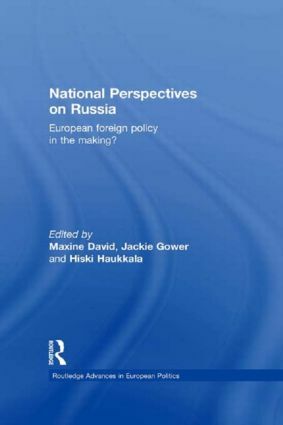 Based on a common analytical framework, this book offers a detailed analysis of ‘national perspectives on Russia’ and how they interact with and affect policymaking at the EU-level. The authors provide deep insights into the relationship between individual states and Russia looking at a range of policy areas: economics, trade, energy, security, culture and education. They are not only interested in examining policy failure but also probing the possibilities of seeing national foreign policies and the bilateralism with third parties that they often entail as a potentially positive resource for the European Union. As Russia is an example of a particularly hard case for EU foreign policy, this book yields important insights concerning the possibilities as well as limits of developing a common EU policy in the future. It will be of interest to students and scholars of European politics, EU Studies, Russian politics, foreign policy studies and international politics.